Birch & Gaydon was a business of retail jewellers, silversmiths and watchmakers that was taken over by Asprey & Co. Ltd. in 1959. The business began in the eighteenth century as a watch repairer, and during the nineteenth century manufactured watches. By 1900 increased competition from Switzerland and America meant that the traditional English craft methods of watch manufacture were no longer economically viable so the business concentrated on retailing watches, jewellery and items made by others. The company can trace its roots back to around 1760. It was established by William Turner, a watchmaker, at 18 Cornhill in the City of London, close to the Bank of England. In 1825 Turner moved his business to 167 Fenchurch St. London. By 1833 the business had relocated to number 173 Fenchurch Street. William Turner died in 1839 and in 1840 the business passed into the hands of William Birch. Birch might have been an apprentice to Turner, but it seems more likely that he purchased the business after Turner's death since William Turner's will instructed his executors to "as soon as conveniently may be ... make sale and dispose of to the best advantage in their power my stock in trade and goodwill as a watch and clockmaker and jeweller ...". In 1874 the company relocated across the road to 172 Fenchurch Street. Whatever his background, William Birch had ambitions to be more than a repairer of other people's watches and became a watch manufacturer in his own right by the traditional English hand craft method of "putting out". Between 1840 and 1860 Birch "manufactured" about 30 watches per year. From 1860 to 1880 this declined to around a dozen per annum, then from 1880 to 1900 rose to around 30 a year. Output fell of sharply in the years after 1900 and by 1920 had ceased altogether. William Birch was born in 1815 and died aged 88 in 1903. Henry Martin Gaydon had joined William Birch in 1877 as a partner, the partnership was named Birch and Gaydon. William Birch retired from the partnership on 29 September 1883. Birch & Gaydon, described at the time of Birch's retirement as chronometer makers, goldsmiths and jewellers at 172 Fenchurch Street, continued with Gaydon as sole partner. In 1904 Birch & Gaydon moved to 153 Fenchurch St. as the premises at number 172 were being demolished. Ownership of Birch & Gaydon passed to Henry Gaydon's son William, who sold the business to Asprey & Co. Ltd. in 1959. Asprey continued to use the name Birch & Gaydon for some time, referring to it as their branch in the City of London. Asprey adverts in the 1960s included "The city man will find a usefully close-at-hand service at Asprey and Birch & Gaydon, 153 Fenchurch Street where, besides the comprehensive stock held, any pieces can be sent from Bond Street at short notice." NB: Some references give the name of Birch's partner as Peter Gaydon. 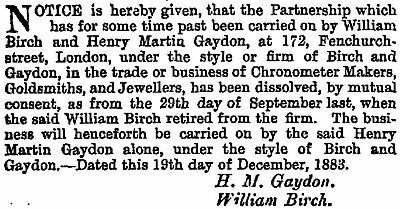 This is incorrect, as can be seen from the entry in the London Gazette for 4 January 1884 shown here, which records the retirement of William Birch and the continuation of the business under Henry Martin Gaydon alone. The advert in the section below about Land & Water watches notes that the West End branch at 19 Piccadilly Arcade had previously been the premises of the company "John Barwise". The company Barwise was another well known London watchmaker, later a retailer only. The Barwise company was started by John Barwise. He had been born in 1756 in Cockermouth, Cumberland, the son of Lot Barwise a clock maker. He appears to have gone to London in his early twenties, some time before 1780. From 1790 to 1851 he was living and working at 29 St Martin's Lane in the City of London. In 1790 he married Elizabeth Weston, daughter of William Weston, a dial enameller who worked for Barwise. John Barwise died in 1820 at age 64. The business was carried on by his sons, Weston (named after his mother's maiden name) and John. Weston died in 1826 at the young age of thirty three. John Barwise junior carried on the business alone until, as an investor, he was financially ruined in 1846 by the collapse of the British Watch and Clock Manufacturing Company, Pierre Frédéric Ingold's attempt to introduce machine manufacturing of watches into England. John Barwise seems to have left the company around 1854 or 1855 when the assets and substantial debts were acquired by Lattey & Co. using funds obtained illegitimately from the London & Eastern Bank. The business was moved to 69 Piccadilly and Jules Rochat, who was working at Barwise as a watchmaker, was appointed manager. Lattey & Co. were liquidated in 1857 and the Barwise business was bought by Douglas Guillaume Cavé. Both Rochat and Cavé went bankrupt in 1869. Much of the information above comes from "Barwise & Sons: watchmakers to the King. A brief history of the family and firm" by A. D. Stewart in the March 2014 Journal of the Antiquarian Horological Society. Little is known about the company after 1869. A notice dated October 1875 announced the removal of "John Barwise, chronometer, watch and clock maker to the Queen and Royal Family" from 69 Piccadilly to No. 40 St. James' street. The John Barwise name survived as a trading name long after the family quit the business. It was still recorded in 1988, a subsidiary of Asprey. I have a Zenith wristwatch in a silver jointed double back case. 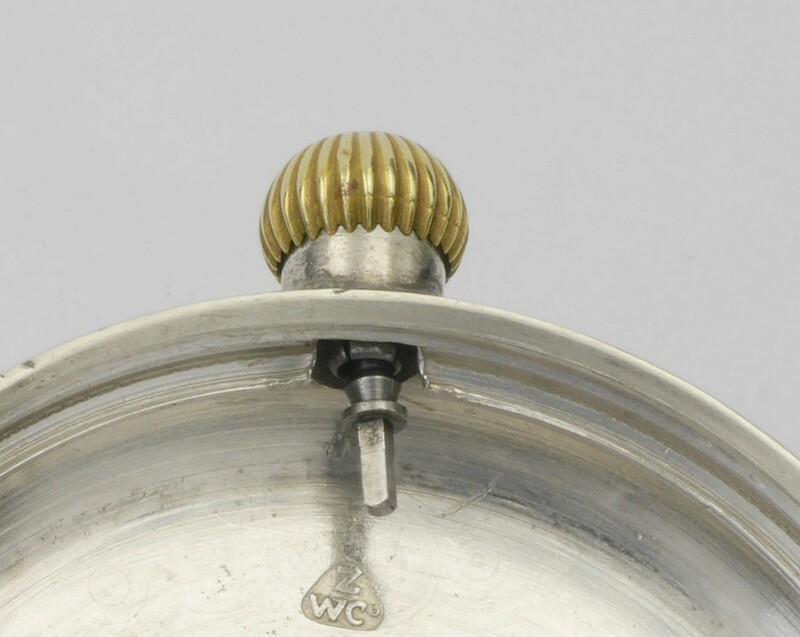 The inner cover is engraved Birch & Gaydon, 153 Fenchurch St. EC and John Barwise, 19 Piccadilly Arcade London W. The hallmarks date this watch to 1914/15. 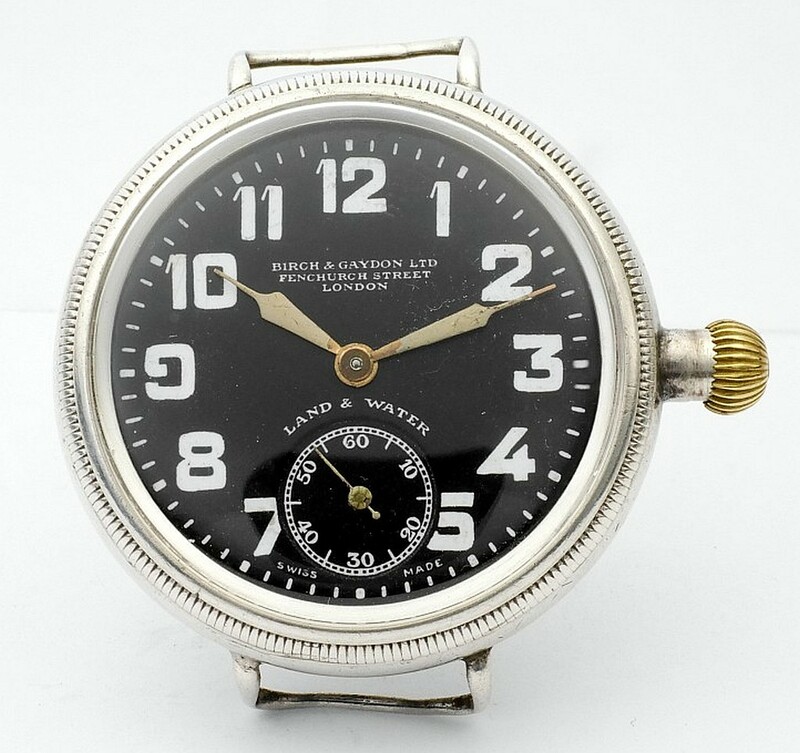 During the Great War Birch & Gaydon sold trench wristwatches under three brand names, Land & Water, Langbourne, and Garfield. These three brands covered three different price points. Land & Water wristwatches were made by Zenith and were the most expensive. Langbourne watches were made by Tavannes and were less expensive. Garfield wristwatches have a Fontainemelon movement and were the least expensive. Although there were three different price points, none of these watches were cheap. Birch & Gaydon were one of the very top London jewellers and only sold the best quality items. From a collector's point of view an early and named model wristwatch with a good quality movement and a provenance like that has got to be worth having. 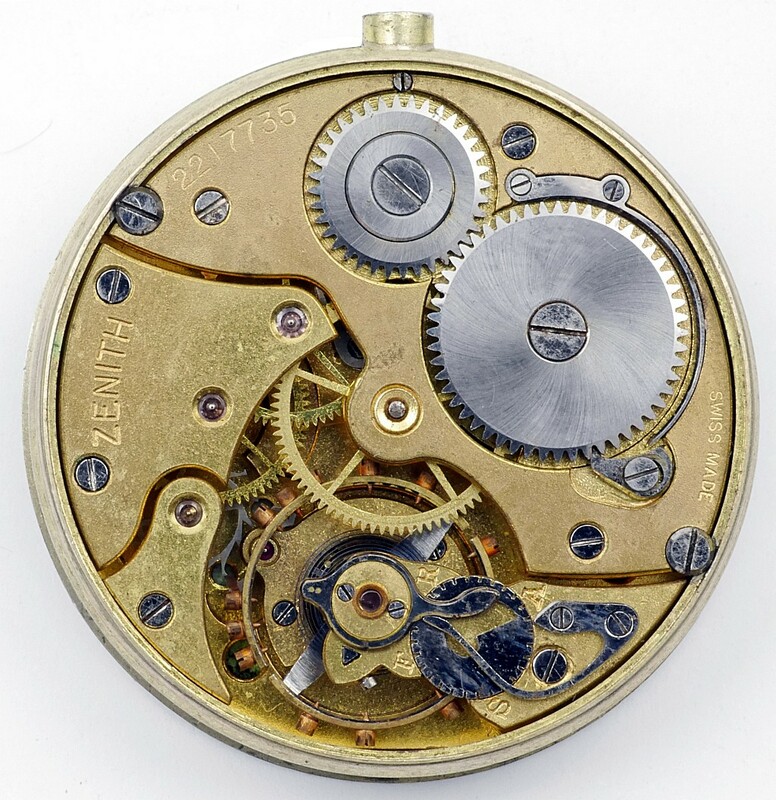 There were two different designs of screw cased watches that carried the Land & Water name, one with no case back, the bezel unscrews and the movement lifts out from the front, the other with a screw bezel and screw back. Both of the different designs of Land & Water wristwatches have Zenith movements. The Land & Water wristwatches are described in more detail in the section Land & Water wristwatches. The Langbourne watches with Tavannes movements have screw back and bezel case similar to the Submarine watch that was also made by Tavannes. 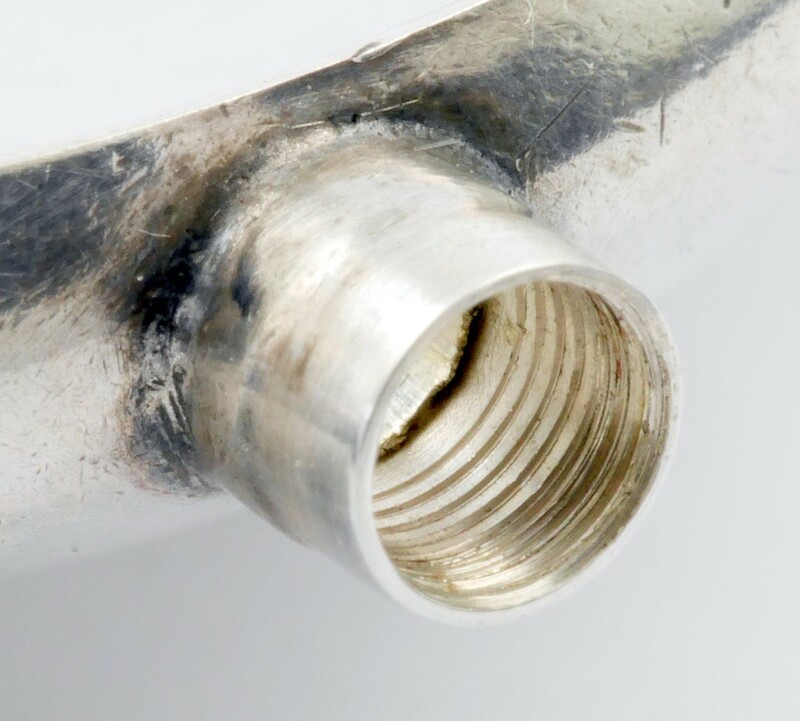 However, the Langbourne case is not waterproof; it does not have the gland in the pendant for sealing the stem, or the recesses for gasket in the screw back and bezel that the Submarine case has. Langbourne cases all carry a reference number 3305910, three lower the reference number seen in all Submarine watch cases, 3305913. This suggests that these numbers are Tavannes case design reference numbers, and that the fully waterproof case of the Submarine watch was a development of the Langbourne case. 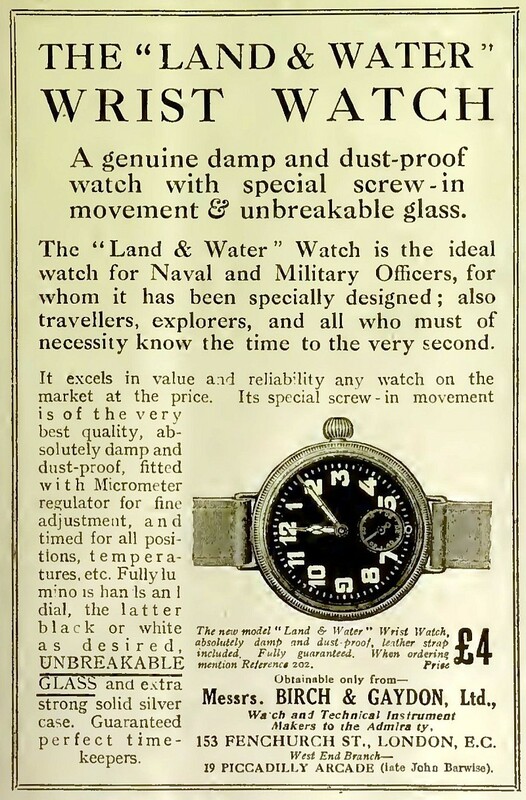 It is strange that Birch & Gaydon didn't sell the Submarine watch, but Brook and Son of Edinburgh advertised that they were the sole agents so had presumably negotiated an exclusive deal with Tavannes. The Garfield name appears to have been used first on a round trench watch, then later on a cushion cased watch. The Garfield trench watch has a simpler and older design of case than either the Land & Water watches or the Langbourne. 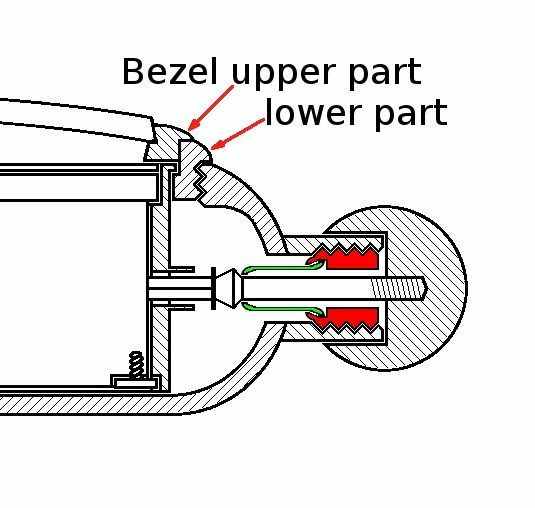 The case of the round Garfield trench watch has a single hinged back with no inner cuvette, and a snap on bezel. The cushion case of the later model has a snap on bezel and snap on back. The movements of the two that I have seen were ébauches from the Fontainemelon factory. They were both fully jewelled with Swiss straight line lever escapements. They would have been cheaper than the Zenith or Tavannes movements, which were produced in smaller numbers and this, together with the simpler case construction, shows that the Garfield range was built for a lower price point than the Land & Water and Langbourne watches. However, this doesn't mean that there is anything inherently wrong with them from a collector's perspective. Fontainemelon could turn out excellent movements, they just made their basic movements in large volumes which meant they could supply them at a keen price. If a watch has a Swiss 15 jewel lever escapement movement, then that was pretty well as good as it got at the time, and has never really been improved on. Birch & Gaydon were one of the very top London jewellers and only sold top quality items. From a collector's point of view an early and named model wristwatch with a good quality movement and a provenance like that has got to be worth having. 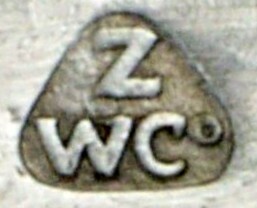 This mark ZWCO in a triangular layout within a triangular shield is the registered sponsor's mark of the Zenith Watch Co. (Great Britain) Ltd. It was entered at the London Assay Office on 16 July 1914 by Herman Frederick Roost, managing director. The company was founded in 1865 by Georges-Emile Favre-Bulle as "Georges Favre-Jacot & Cie". The first workshop was in the Billodes district of Le Locle; it may have been on the same spot where Breguet had his workshop 1793 to 1796. The first trademark registered was "Billodes". In 1897 the trademark "Zenith" was registered in Switzerland. In circa 1914 the company name was changed to Fabriques des Montres Zenith based at Le Locle, Switzerland, with a British branch at 119 High Holborn WC. In England Birch & Gaydon appear to have been the principal retailer of Zenith watches. Zenith had an office in London and one would think that this meant they must have been dealing with more than just one company. In Scotland Zenith watches were sold by Brook & Son of Edinburgh. The wristwatch that I described above with the inner hinged cover engraved Birch & Gaydon and John Barwise was made by Zenith and carries their sponsor's mark ZWC. The date of 1914/15 given by the hallmarks is within the year following the first registration of the ZWC sponsor's mark by Roost.